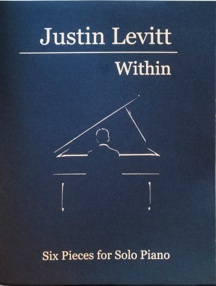 Within - Six Pieces for Solo Piano, Volume 1 is a combination solo piano songbook and CD of six original compositions by SF Bay Area composer/pianist Justin Levitt, and what a treat it is! Three of the six pieces (“Within,” “Sweet Contentment,” and “Peace at Night”) won top awards in the Music Teachers’ Association of California’s State Composition Competition in 2012 and 2013, but all six are truly exceptional. 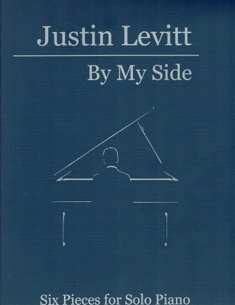 Calling his genre of music “Life Music,” Levitt says that his music comes from the heart, expressing life experiences and emotions. That certainly comes through in the music, both listening to it AND playing it. 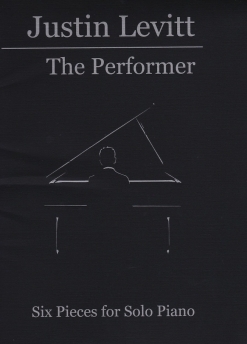 The book is beautiful from the striking dark blue cover with silver print and simple but striking outline of a pianist viewed performing from the back to the creamy stock that the music is printed on with crisp black type and large, roomy notation. The recording makes most of the pieces sound easy, and a few are, but the challenge in music that is spare and open is to make it as clean and error-free as possible while playing with full expression. There are some tricky key signatures and several passages are fairly difficult to count, but listening to the recording will simplify the process greatly. 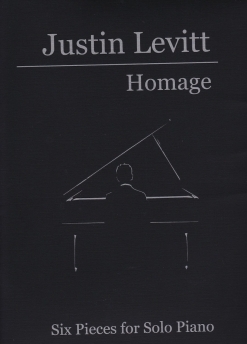 The introductory pages give a bio of and message from Justin Levitt as well as a brief explanation of the inspiration for each piece. As I said, it’s a beautiful book, and most pianists of an upper-intermediate to early-advanced playing level should have no problem with most of the songs. Within (Key of Db (5 flats), 4 pages): A slow, gentle ballad with a flowing, repeated left hand pattern and uncluttered melody line, this is one of the easier pieces. There are several octave runs, but they are slow and fairly short in duration. As Long as You’re With Me (Key of Eb (3 flats)/B (5 sharps), 5 pages: This tender love song is a light and gentle expression of affection. There are some quarter note triplets and octave chords, but that’s about all that’s challenging - that and playing with lots of expression! Peace at Night (Key of C (0 sharps or flats), 3 pages: Very slow and still, this piece was conceived as an experiment to play the piano for Justin’s sleeping children without disturbing their sleep. This one has a couple of chords with a reach of a 10th, but I was able to pick up the top LH notes with my RH in those places without any problem. Anima (Key of Db (5 flats), 4 pages: Almost hymn-like, this beautiful piece does have some tricky timing that less-experienced pianists may find challenging (half note and quarter note triplets), but keeping the left hand rhythm steady (and listening to the CD!) should help to solve any problems. Mansion Rag (Key of Eb minor (6 flats)/ D minor (1 flat), 4 pages: Ragtime piano is one of my musical passions, so this is my favorite of the six pieces. A slow, minor key rag, it’s great fun to play - even with six flats in the key signature! Sweet Contentment (Key of Bb (2 flats)/ Gb (6 flats), 5 pages: This is the most classical of the pieces (akin to The Romantic era) and probably the most difficult to play correctly, but it’s soooo beautiful that it’s worth the effort. Timing is again the biggest challenge, but careful attention to detail will produce a gorgeous and heartfelt piece to lose yourself in each time you play it. Within is currently available only from justinlevitt.com. Highly recommended!